Jeannine Sills, President of La Société des filles du Roi et soldats du Carignan (SFRSC) and native of The Soo, Ontario, reflects on history and how her own story, and that of her parents, echoes the travels and experiences of our early ancestors. She gives voice to the feeling many have of a deep connection to the Great Lakes region as a place we call home — and as a place where many of our families have lived for generations.—ed. 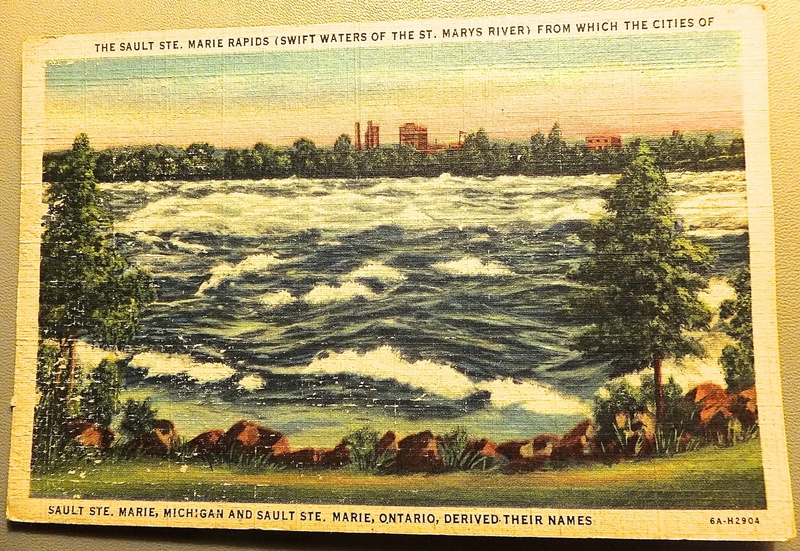 Antique postcard featuring the rapids at Sault Ste. Marie, courtesy of Jeannine Sills. “Where are you from?” I am often asked. “The Great Lakes region. The Soo. It’s a twin city with Soo, Michigan.” How many times have I said that over the years? I miss my home ever since life took me to the opposite side of the country. Like my ancestors and my parents, I have gone exploring and settled somewhere else for what might be a better life. Growing up in Sault Ste. Marie, Ontario, a town with a very French name, I was surrounded by other French-Canadian families. I went to the only French school in town next door to the only French church, both bearing the name of St. Ignace, founder of the French Jesuit missionaries who came through in the 1600s. We were a minority in town as were my Italian and Polish neighbors. My friends had several siblings but I was raised alone. My parents and their first child had left the Trois-Rivières area in Québec, for the northern part of the province called Abitibi where my dad worked in various jobs. Life was not easy. Over the years, they would lose five babies to various illnesses. Only recently was I able to visit their graves…two sisters in Amos, and three brothers in Macamic. Eventually my father would move the family once again, this time leaving his beloved province for Ontario where there was work to be found. And I would be born there. By then my surviving sister was already 18 years old, and after working a couple of years at Algoma Steel, she felt that she belonged back in Québec, near our grandparents. She would marry and raise her family there, while I grew up in the bilingual community of the Soo, taught by French nuns. Graduation Day, Sault Ste. 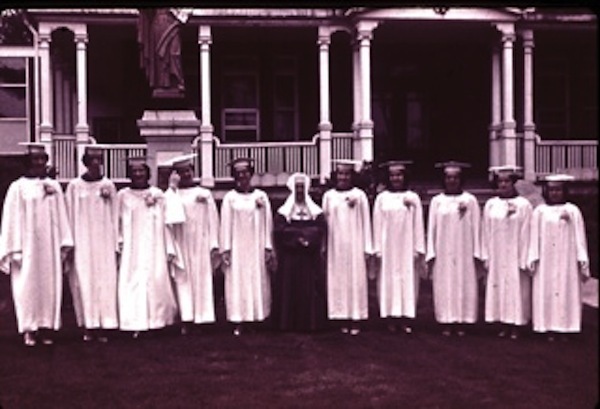 Marie École Saint Ignace, with La Fille de la Sagesse, Sister Roger de la Providence. At school, we learned all about the coureurs de bois, missionaries, filles du roi, Cartier, and Champlain. We watched our parents dancing in the church hall to the traditional fiddle tunes of their earlier lives. Yearly trips “across the river” to Michigan with my sister and her family visiting from Quebec would take us to St. Ignace and Marquette with all of their history, which was also ours. Unlike many of my classmates, when I had a friend over we were not allowed to speak English in the house although movies, radio, and television were all in English. My mother had not mastered the language and she insisted that I use French in her presence. This would prove very important later in life when I was able to make a career out of my mother-tongue. As a young woman teaching night classes in the Soo, I was shown a list of names by one of my adult students who believed he was a relative of mine. His map showed the Ile d’Orléans and Château Richer. He also tried telling me my name was different in the beginning. I had no idea then, that he was talking about “dit” names. Indeed, as it turned out, my 6th great-grandfather had arrived in that area in 1636 and some of his descendants would take the “dit” name while others would take his original name. Years later, I would choose to experience life as a stewardess in Montréal rather than Toronto, in order to be near the homes of my ancestors. In a weekly call to my sister talking for hours in French, I can’t help but think that my mother is smiling down on us from a heaven where we all speak the same language. As I look over my lineage, I have certificates for eleven filles du roi and two soldiers from the Carignan Regiment. In my matrilineal line I see that my 8th great-grandmother is Hélène Desportes married to Guillaume Hébert, the son of Louis Hébert and Marie Rollet, making these founders of a new people, and a new nation, my 9th great-grandparents. History lessons have really touched my life in a way that I could never have imagined. The most important stage of my upbringing took place in the footsteps of my ancestors. One need only look at ancient maps to observe the land settled by the French during the 17th century. Is it any surprise that I have a special place in my heart for the Great Lakes, Michigan, Ontario, and Québec? It was my home, and the land where my ancestors walked centuries ago. Great story Jeannine, truly enjoyed reading it…..
Well thanks Jesse…as I did yours. Thanks Vivian. I know for a fact that the Soo has changed quite a bit. It was great when I was growing up and I suppose it still works for people living there now. Both SSM Michigan and Ontario have great Facebook pages. I agree Vivian. They’re both quite nice. We also have a special page on the Canadian side: You know you’re from Sault Ste Marie Ontario when…which has 2,679 members reminiscing every day. I will always have a special link to the Soo because my dad chose to be buried there. My mother on the other hand,lived a few more years near my sister in Northern Quebec and that is where she is buried. Such a fascinating and interesting read Jeannine!!!! As you know, I still live in Sault Ste. Marie and think it is an absolutely wonderful place to raise a family. I have fond memories of your parents, as your family was close to our family. What a shame they took down that beautiful historic building where you lived at the corner of John Street and turned it into a Tim Horton’s!!! I remember visiting your family there. Tracking down your family history is an enormous amount of work. You are obviously very passionate about this and it has paid off for you. After all, who can say they know where they came from back through so many generations? I don’t know too many people who can and I certainly can’t. I was very lucky to have lived with my great grandparents. I’m sure you would remember them; Victoria Cote and Eugene Cote. I know you knew my grandmother, Cecile Aube. I’ll be sharing this journal with my mother. She will be thrilled. Thanks so much for posting your story. Thanks Rejeanne. I remember your grandmother fondly. I could tell you a few interesting stories about her. What a nice lady! And yes you’re right about my findings in genealogy. I am working hard to leave my history for my grandchildren who are quite removed from French Canada,sad to say. Wonderful story, Jeannine! Now I know a little more about why you seem to want me to document my Filles et Soldats lineages–you have 11 filles! plus 2 soldiers. We share a ggmother–Helene Desportes–though my lineage goes through her 2nd husband Noel Morin. Ah. Well there you have it Patricia. I look forward to sending you a beautiful certificate when you find that first Fille du roi. Hi Jeannine–Truly fascinating read. I have always loved the French language. I will forward to some of our friends and relatives. Have you started teaching your grandchildren this most beautiful of all romantic languages?? I took conversational French one semester at Southern Methodist Univ. Sadly, I needed someone with whom I could speak French. I just said to Jay, “Parley vous France” Correct me on that. He took one year in high school in New York. I do have a few friends who took French under Bess Bozelle at Central High School in Omaha, NE. I was too embarrassed to say anything because my pronunciation was so imperfect. She was my homeroom teacher. More later. Hi Mary, glad you enjoyed it. You might also enjoy the other stories on this site. They’re all very different and quite interesting.